Girls getaways – let me count the ways. Getaways for Bachelorette parties. Getaways from husbands. Getaways to escape the cold. Getaways from children. Getaways to recharge. Getaways, well just because you want to and you can! Any of those and numerous others are good reasons to plan a stay at Secrets Maroma near Cancun in Mexico. Cancun is one of those places that is easy for almost everyone to get to with minimal travel hassle. No less than 15 airlines have daily nonstop flights from within North America. There’s even a daily non-stop from London! So if you have friends who are geographically scattered it can be a convenient meeting place. Secrets Maroma is ideal for a girlfriend getaway because it has everything you need for a wonderful mini-vacation all on one property. 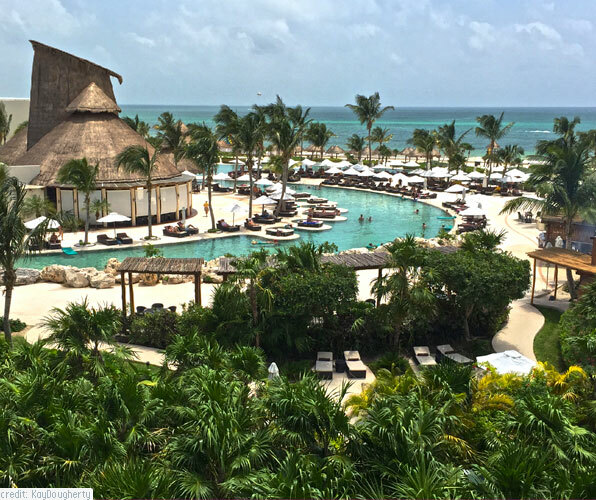 The 5 star AAA Diamond luxury resort is all-inclusive without sacrificing any quality. It’s for adults only so your Zen won’t be interrupted by a squealing slippery kid doing a cannonball beside you in one of the 13 pools. And it is really easy to arrange. Secrets Maroma has an option where you can go on their website and book your stay and your airfare all at the same time. Get your passport out of one drawer and your bikini out of another and off you go. Often within a group of friends or family there are varying levels of interest in how busy people want to be on a getaway. At Secrets Maroma you can each choose to be as busy or as relaxed as you want. There is a wide range of activities available throughout the day and they are of course completely optional and included in the price. (Sensing a theme here?) You can learn to mix cocktails, take a dance lesson (no partner needed), windsurf, kayak, play mini-golf, work out at the fitness center or indulge in a wide array of other options detailed for you on a daily activities briefing left in your room. One of the most popular daytime pursuits is lounging on a chaise lounge at the pool or the beach. Maroma is one of the world’s most pristine beaches and has frequently been cited as being among the top 10 beaches in the world. Depending on the light the water ranges from aqua to turquoise to sapphire. The waves are gentle and the sand soft. There aren’t any rocks or hot sand to spoil your fun. Put on an SPF top before going in to play in the water because you’re likely to stay out longer than you expected! And know what you want to eat or munch on when you get out of the water because one of the friendly waiters will be coming right over to see if they can bring you anything. Every evening there are a couple different types of entertainment available. It may be singers, a water acrobat troupe or a comedy club – possibly all on the same evening. The acts aren’t long which is nice if you want a forty-five minute to an hour sampler of something but don’t want to commit your whole evening. And then there’s the pampering that can be the focus or just a wonderful side benefit of a girls getaway. Secrets Maroma has a 13,000 square foot spa with offerings ranging from manicures and pedicures to various types of facials, rubs and massages. They can take that stressed body of yours and turn it into a puddle of gooey happiness! OK, good food, entertainment, lots to do (or not) and a spa – what else is there? Well they have well-trained knowledgeable staff in the front lobby who can book you for any excursions you may want to try while you’re in the area. Want to swim with whale sharks, go out on a boat to snorkel, parasail, ride a horse in the ocean? They can make it happen. The theme of lots of options also extends to room selection. Do you want a suite with two bedrooms and two baths? Do you want a room you can swim up to? Separate rooms because everyone really wants to get away? Those options and more are available. Probably the biggest “luxury” of all at Secrets Maroma is the people who work there. 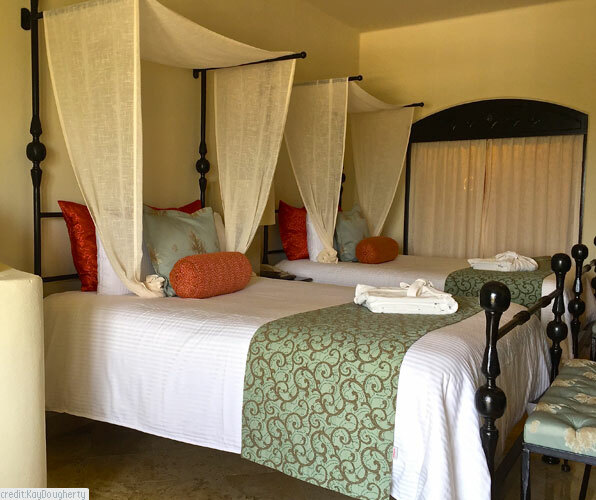 Look at the reviews of Secrets Maroma on Trip Advisor or elsewhere and you will see that nearly everyone remarks on how genuinely nice and eager to please the people are. By the second day the man who brings you your drink on the beach will feel like your new best friend! And lastly there are the little perks that make life easier and costs more predictable. Wi-Fi is free throughout the property as are calls to anywhere in the United States or Canada. So if you really miss that man or those kids you couldn’t wait to get away from you can give them a call! To get the most out of the property’s connectivity it’s best to download the Secrets app to your phone before you go. That way your “personal concierge” can show you how to forward calls to your phone, view activity options and more. And finally you can enjoy your time away and leave with heartwarming, professional digital memories by using the on-site photographer. Unlike most places you only buy the pictures you want. This leaves you free to take that nap, not drown your phone or send regrettable selfies that seemed good enough at the time! Whether you stay for a long weekend or a whole week you will be rejuvenated and probably decidedly reluctant to leave when your stay is up. Warning; reentry to the real world can be unsettling! Secrets Maroma; an easy, luxurious, complete getaway for big girls.